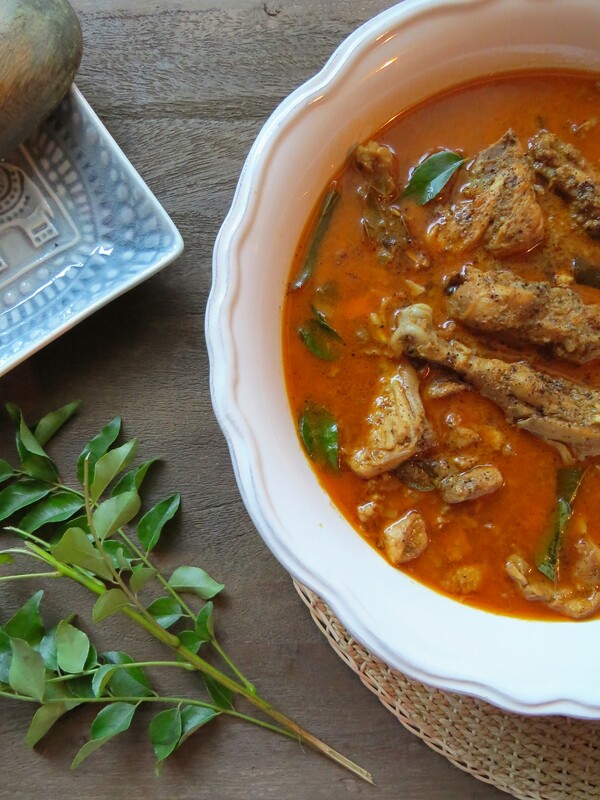 Chicken curry is a popular dish that is made often in the homes of Sri-Lankans. The curry is not only known for its heat and flavours, but also for the unbelievable aroma that arises during the process of cooking. The curry is very versatile in that it can be eaten and is eaten with anything from plain rice and bread to fancier dishes such as biryani. Truth be told I never particularly enjoyed chicken curry as a child and I became a vegetarian at 13 years old (after years of convincing my parents), but the day I married my meat-loving man I knew I’d be learning to cook this curry. Over the last few years I have experimented with this recipe, often harassing my husband to critique my chicken curry every time. All the experimentation has led to the recipe that I am about to share today. 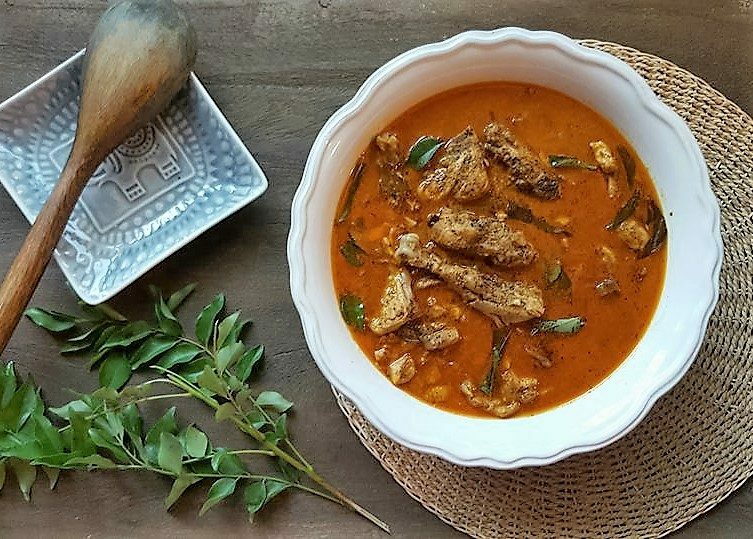 The carefully selected list of ingredients in the right proportions is what creates the flavour upon flavour sensation that Sri-Lankan chicken curry is well-known for, and of course you can adjust or omit ingredients as per your taste. A dear friend is eagerly waiting for this recipe and it is for her, that I finally got around to posting this. Marinate the chicken in the yogurt and turmeric for about half an hour. This step tenderizes the meat. 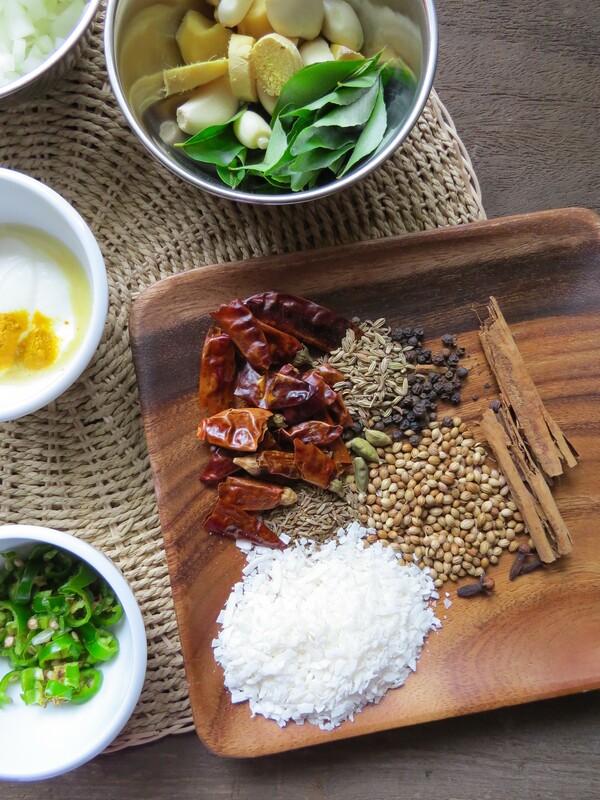 While waiting for the chicken to marinate, prepare the spice mix (recipe below). Heat the oil in a large pot on medium-high heat. Once the oil is hot, add the onions and bay leaf. Sauté until the onions are golden and translucent. Add the garlic and ginger paste and sauté for just under a minute. Add the chicken pieces, green chillies, and sauté for about two minutes or so. Add the spice mix, roasted curry powder, and water. Cover the pot and turn the heat down to medium. Let the chicken cook for approximately 40 minutes, stirring every so often. 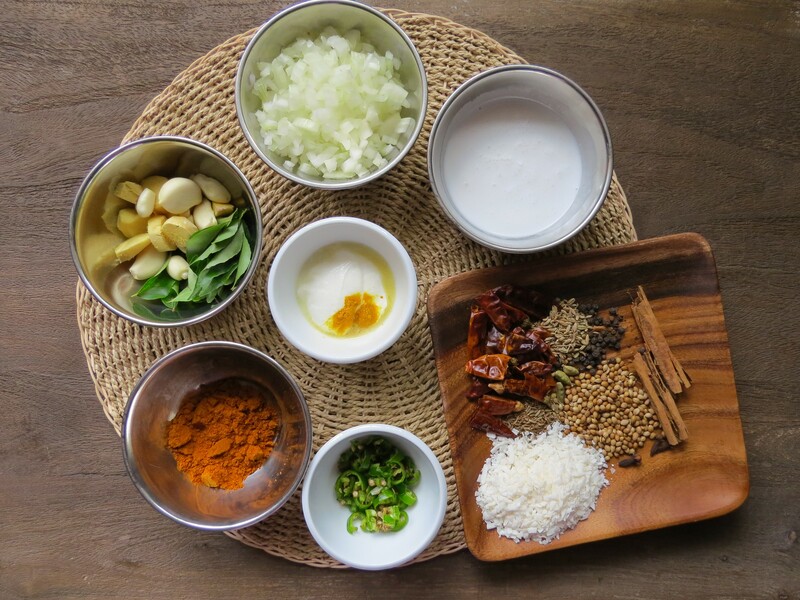 Add the coconut milk, curry leaves, and salt and bring the contents of the pot to a boil. Let the curry cook uncovered for another 10 minutes or so until the gravy reaches desired consistency. Toast the shredded coconut in a pan on medium-low heat, until browned. Take care not to burn the coconut. Once toasted, set aside. Roast all the other ingredients until lightly browned and fragrant, taking care not to burn the spices. Once all ingredients are cool, grind them together to make a wet mix. If needed add a bit of water to help grind the spices into a paste. Use in recipe as per stated. I absolutely love this recipe! It has the perfect blend of spices and is so aromatic! This is by far the most authentic version of Sri Lankan chicken curry I’ve made. Thank you so much for sharing! Can’t wait to try some of your other recipes!